Twenty-one of us left the Tsawwassen Ferry terminal on Wednesday, October 10 at 10:10 a.m. on the Queen of Nanaimo to begin our DNCB Gulf Islands Ferry outing. 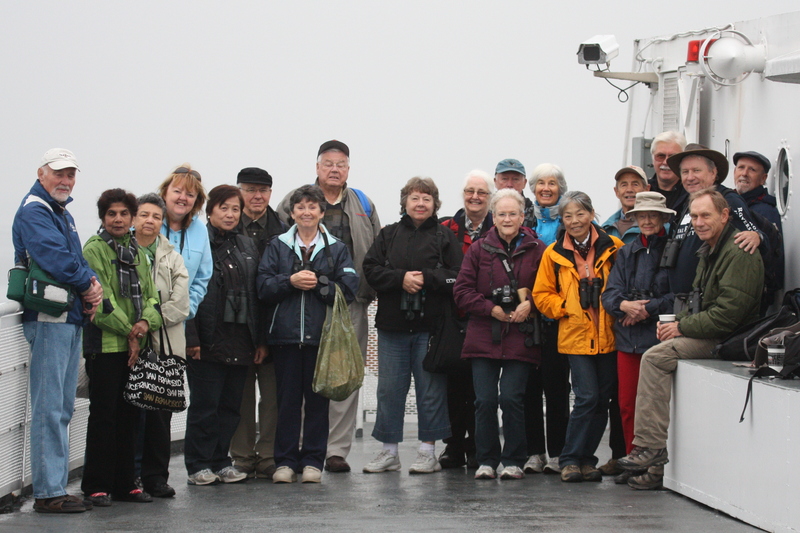 It was foggy, but fairly mild, most of the day; we saw some Loons, Guillemots, Grebes, lots of Bonaparte Gulls and had a full day of non-stop chatter and almost non-stop fun, both on the ferries and on Salt Spring Island. Check out photos by linking to our Picasa site from our DNCB Blog at www.dncb.wordpress.com or directly at http://picasaweb.google.com/dncbirding. We were: Roger & Rose, Hans & Coralie, Dave & Donna, Manfred & Margaret, Graham the Brit, Warren, Lorna, Sheila, Jane, returnee Johnny Mac, Eleanor, Marion, Mike, Birthday Kay, Donna T, Terry and me. We all met at the stern of the boat, took an early Group Photo, and lamented that Leona, Mai and Al (Al had car trouble and they missed the boat) and Ken & Anne were missing from the expected participation list. We introduced the many newbies to each other as we watched Common Loons (some still in breeding plumage), a Pigeon Guillemot and a Rhinoceros Auklet, closer to the boat and shore than they usually are. Harbour Seals were poking their heads up around us too. Several left the outside deck to enjoy the ferry breakfast before reaching Active Pass. 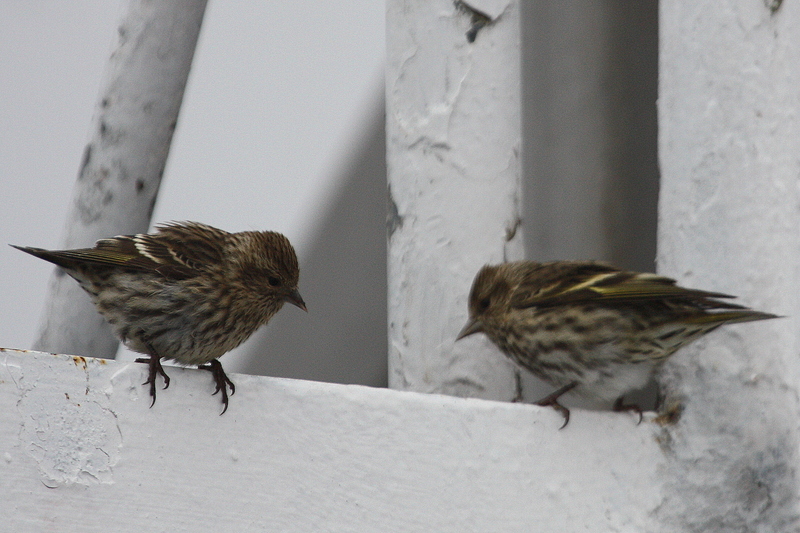 We returned outside to watch a flock (~100) of Pine Siskin circling and landing on the deck, at our feet. They seemed to be hitching a ride across to the Islands. 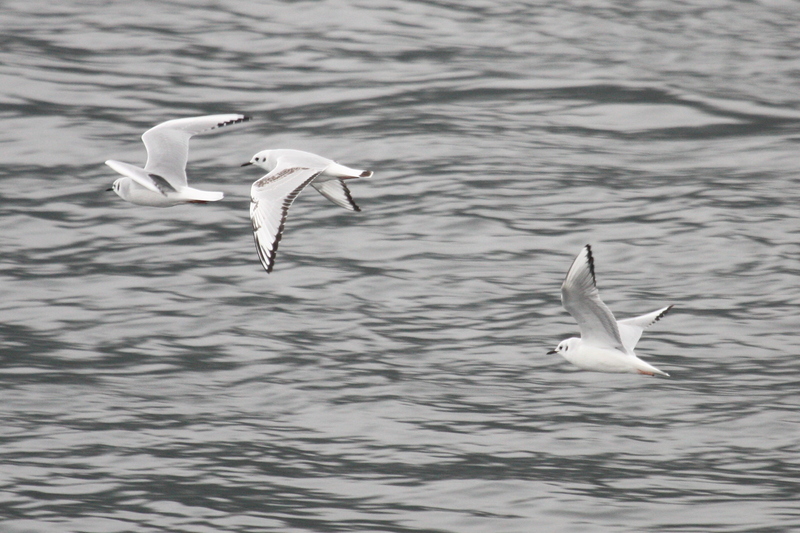 As we approached Active Pass and our first stop at Galiano Island, hundreds of Gulls were feeding and flying. Many were Bonaparte Gulls. Roger saw one Snow Goose and a Western Grebe, but we did not see any Terns or Jaegers. In Sturdies Bay we saw our first of several Belted Kingfishers; there seemed to be resident Kingfishers at each port. 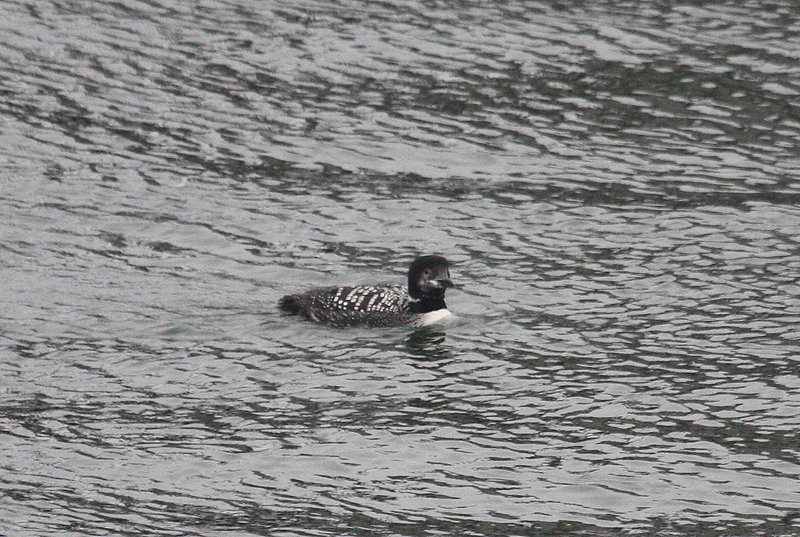 Terry spotted a pair of Harlequin Ducks on the shoreline while others were comparing Pelagic and Double-crested Cormorants which were everywhere. Nothing different was spotted on the way to Village Bay on Mayne Island or to Otter Bay on Pender Island. But everyone stayed outside at the bow enjoying the gorgeous scenery. At Long Harbour on Salt Spring Island, our 4th stop, we got off to take the small community bus to idyllic Ganges town. To accommodate the 21 of us, the bus had to make a couple of trips. No worries; the extra wait for Mike and me made the beer that Roger bought us in the Local Pub (that’s its name) that much more delicious. Wandering around Ganges, we met veteran DNCBer Valerie who joined us from her new home in Victoria. 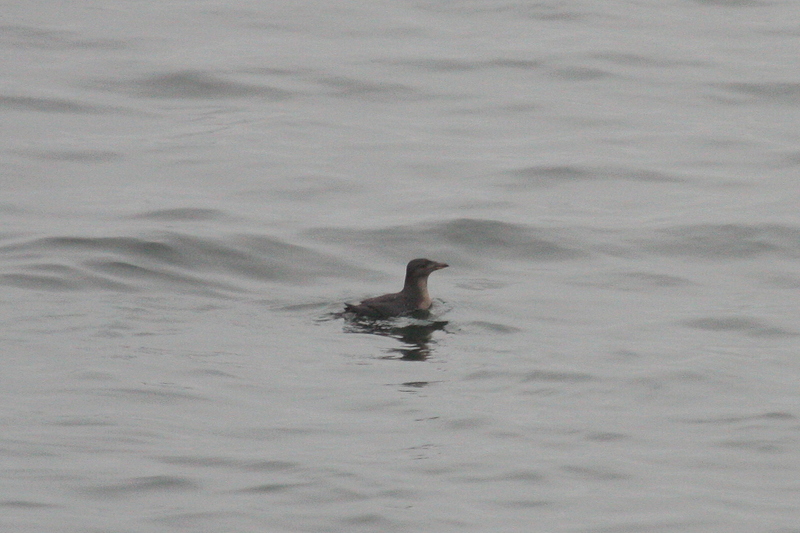 We also saw a neat Red-necked Grebe in the bay by Ganges Park. The shopping in Ganges seemed to be a trip hi-lite for a few of the ladies. Because the bus would not hold all of us to the next ferry, the group split. Terry plus 8 took the bus back to Long Harbour and then the 3-stop Gulf Islands ferry back to Tsawwassen. The other 13 (including Valerie) took the bus to Fulford Harbour and the ferry to Swartz Bay, then the big ferry to Tsawwassen. I did not like the “split” but it was the only solution to ensure we all got back to Tsawwassen around 6:30 p.m. Before the “split” Kay shared her Japanese biscuits with each of us, so we all sang Happy Birthday, except the bus driver who was 30 seconds behind schedule. 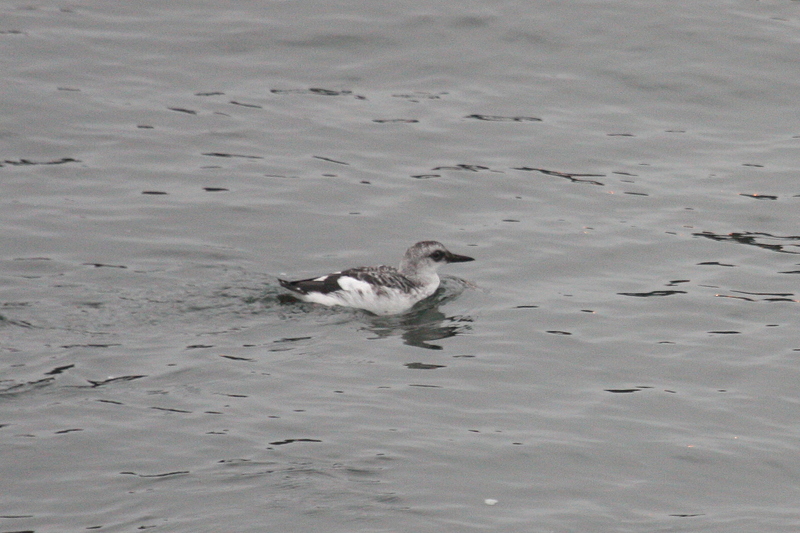 Terry’s group saw some Surf Scoters and more Pigeon Guillemots on the way home, but nothing else new. 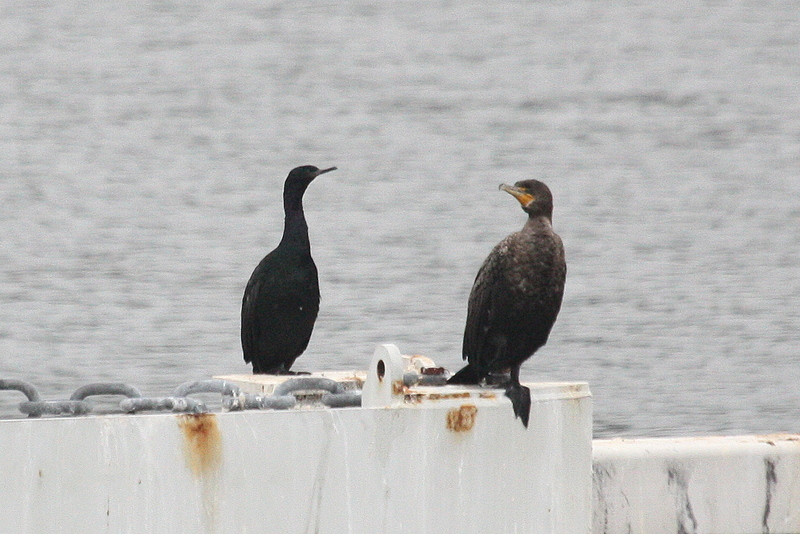 We saw a couple of Harbour Porpoises and several Brandt’s Cormorants (the 3rd Cormorant species) on the ferry to Swartz Bay. We got fresh “Freebie” Ferry tickets at the Swartz Bay terminal before boarding the 5:00 p.m. to Tsawwassen. Some enjoyed a scrumptious Buffet Birthday dinner on the ferry while a number of us (one is a number) rode the whole way outside at the bow facing the icy wind. The “number” of people outside dreamt of seeing pods of Orcas and White-sided Dolphins, and Common Murres and Marbled Murrelets, and Long-tailed Ducks and other stuff, but didn’t. Both ferries got to Tsawwassen around 6:30 p.m. and I think everyone was happy, at least I was. This entry was posted in *DNCB, Galiano Island, Gulf Islands, Harbour Seal, Mayne Island, Pender Island, Salt Spring Island. Bookmark the permalink.